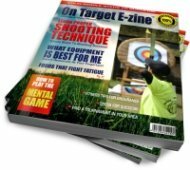 On this page you will learn about Set Up which is the fourth basic archery step of the shot sequence. In this step you will learn how too properly align the elbow on your bow arm, how to raise the bow arm, and the proper position of the shoulders and chest and what to do with the drawing arm. The Set Up step seems relatively straight forward...after all, you are just raising the bow right? The reality is anyone can do this without a lot of thought but if it is done incorrectly you can easily restrict yourself from achieving proper upper body alignment. • Is your bow hand properly positioned so it remains in the same location on the grip through the entire process? - Hint: If you find yourself re-adjusting your grip during the Set Up or the next steps, then you need to re-evaluate your initial grip setting. I cannot stress the importance of this enough. Get the grip right in the first place or "let-down" the bowstring and start the process over. • Hooking: Check that your fingers are hooked at the first knuckle. - If you are hooking to deep (beyond the first knuckle) your string will not come off of your fingers evenly. - If you are hooking too far out on the tips of your fingers, you will be apply excessive loads on the finger joints, muscles and tendons which will result in pain. • Footing: Check your footing. It is possible that while you were focusing on other tasks you moved your feet out of alignment. • Hip alignment: Check the location of your hips. They should be rolled under your upper torso so that your lower back is flat and strong. • Chest: Your chest should be lowered to bring your COG lower to the ground. With the fingers hooked around the bowstring and the bow hand settled in to the proper grip position, extend your bow-arm forward. The elbow of the bow-arm should be rotated vertically. It is important that the bow-arm shoulder remains lowered during the next action. The forearm of your drawing hand (bowstring hand) should move and remain as close to "in-line" or parallel to the arrow during the next action. Raise the bow-arm up slightly above your point of aim (slightly above nose level and pointing in the direction of the target). Move the drawing arm behind the arrow so the forearm is "in-line" with the arrow shaft. As you raise the bow, rotate your chest and shoulders so your upper body is parallel to the arrow (perpendicular to the target). The hand on the bowstring should be raised to the approximate level of your nose. Check your bow-arm elbow. It should be rotated so the inside joint at the elbow is straight up and down. During the later part of the Set Up action (as the bow arm is being raised) your bowstring hand should be slightly drawn back so it remains near your body. Note that this is not the actual step or process of "drawing the bow". When performed correctly you will use the leverage of the bow-arm and the upward circular motion to create tension on the bowstring. Think of your bowstring hand moving in a line straight up while the bow-hand rotates around the shoulder joint in an upward motion. The goal should be to capitalize on the best biomechanical position of our extremities for efficiency and setting yourself up for the next step, Draw and Load. There are a lot of things going on all at once in this step. 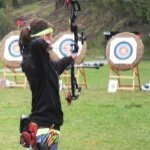 Think of your bow arm as a lever that is rotating around the bow arm shoulder and focus on the bowstring hand moving up toward your nose in a straight line. The thumb of your bow hand should not be wrapped around the grip - rather, it should be pointing "down range" toward your target. The fingers of the bow hand should remain relaxed. Have A Question About Set-Up?